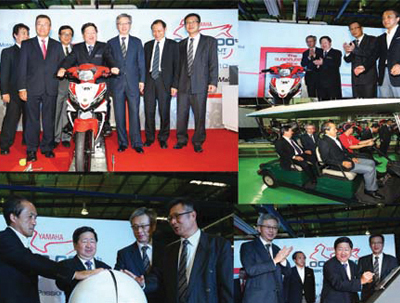 Selangor, October 19, 2012 – Hong Leong Yamaha Motor (“HLYM”) rolls out its three millionth motorcycle production at its Sungai Buloh factory, today. This milestone event earmarks HLYM’s achievement of hitting another one millionth production within a short period of five years. This achievement reflects customers’ confidence and trust in the Yamaha brand, hence making it one of the most preferred motorcycles in the country. The event to mark the significant milestone was officiated by YB Senator Dato’ Ir Donald Lim Siang Chai, Deputy Minister of Finance. Also present were Mr. Hiroyuki Yanagi, President of Yamaha Motor Co. Ltd.; Y Bhg Datuk Kwek Leng San, President & CEO of Hong Leong Manufacturing Group, Y Bhg Dato’ Yau Kok Seng, Group Managing Director of Hong Leong Industries Bhd, and Mr. C H Ng, Managing Director, Hong Leong Yamaha Motor Sdn Bhd. Speaking at the roll-out ceremony, Mr. C.H. Ng, Managing Director of Hong Leong Yamaha Motor Sdn. Bhd. said, “We hold true to our commitment to offer quality product and services of exceptional value in accordance with global standards and our discerning customers. “Armed with our management’s desire to innovate mobility for Malaysians, we embarked on transformation of production capabilities by incorporating state-of-the-art technology and automation coupled with implementing human development programmes to nurture a highly skilled and competent workforce over the past five years”, commented Mr. C H Ng. To further increase production capacity to meet current and future demand, Hong Leong Yamaha Motor initiated an expansion programme to raise production capacity to 250,000 units per year. The capacity expansion programme involved the installation of a new Electro Deposition Painting line which is environment-friendly; a new plastic paint shop with three stages of washing that reduces dust contamination; a second line coupled with stand-alone unit cells designed for assembly of big engine capacity motorcycles like the Yamaha XJ6 Diversion. The existing conveyor line was also expanded. HLYM also installed a series of final inspection equipment with testing facilities to ensure production of high quality products and only certified safe motorcycles could be allowed on the road. The industry experienced a growth in the motorcycles sales in the first eight months of the year, recording an aggregate of 412,000 units and is expected to reach 600,000 units in 2012 compared with 532,000 units in 2011. Hong Leong Yamaha Motor Sdn Bhd is a joint venture between Hong Leong Industries Bhd and Yamaha Motor Co., Ltd. Japan that was incorporated in 1979. It is tasked to assemble and distribute Yamaha bikes of superior and innovative quality to the Malaysian market. Hong Leong Yamaha Motor rolled-out its first model the RX100 model from the first assembly plant in Shah Alam in 1979. Currently, Hong Leong Yamaha Motor operates from the Hong Leong Yamaha Complex, which was established in 1997 and located in Sungai Buloh. Over the years it enjoyed significant achievements, namely the roll-out of the 500,000 bike in 1988, hit the 1 million mark in 1994; 2 millionth unit rolled-out in 2007 and hit the 3 millionth motorcycle in 2012. To date, Hong Leong Yamaha Motor assembles an innovative motorcycles model line-up of: Mopeds – 135LC hand clutch and auto clutch, Lagenda 115Z & ZR and Y125ZR. The Automatic range are Ego S, Ego LC, Nouvo LC while Street range are FZ150i and XJ6 Diversion. In line with its corporate philosophy to achieve excellence and to have environment-friendly processes in place, Hong Leong Yamaha Motor carved its name as the first motorcycle manufacturer in Malaysia to have achieved triple certifications, namely of ISO 9002 for quality management system; Total Productive Maintenance (TPM) award for enhancement of quality, cost and delivery from Japan Institute of Plant Maintenance; and the ISO 14001 for environment management system. 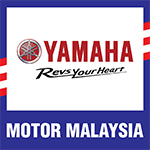 Hong Leong Yamaha Motor currently has an extensive dealers’ network nationwide including East Malaysia.